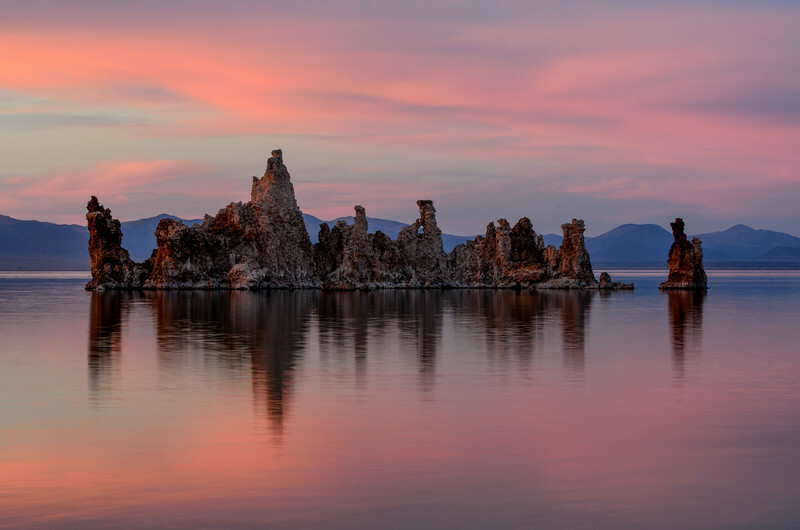 On my recent visit to the Eastern Sierra, I finally got around to visiting the shores of Mono Lake. My timing was good: about 20 minutes after pulling up to the South Tufa area, this sunset popped. Click above to see a larger image. I'm guessing about three dozen other people came home with very similar photos that night -- this area is immensely popular with the shutterbug crowd. I can see why. And I don't even want to know how many tens of thousands of people have taken the above shot over the years. I took this photo with my Nikon D5100 with the 55-200mm telephoto lens that came with my old Nikon D5000. I put the camera on a tripod and used a shutter speed of .8, which helped give the water a smooth and glassy look. If you're in the area, I recommend a visit. To get to this spot from Mammoth Lakes, drive 20 miles north on U.S. 395 and turn right on Highway 120. Continue five miles and turn left onto the good dirt road to the parking lot for the South Tufa Area and follow the trail to the lake's shore and pick a spot. Here's a wider view of the area. More of my work is on my SmugMug site. Follow me on Twitter. This photo is © Steve Hymon and it may not be used elsewhere on the Internet or in other media without the advanced permission of Steve Hymon.